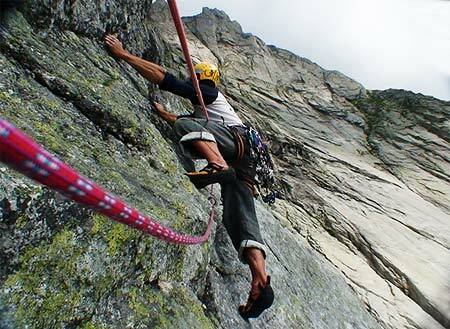 Luca Maspes & Co climb 11 new routes in Valtellina during summer 2006. Luca Maspes, free from imminent expeditions to the greater ranges, spent this summer exploring the mountains and walls close to home, namely in Val Masino, Bernina and Val Grosina. The Italian Mountain Guide climbed with a close-knit group of friends or alone and produced 11 new routes during his somewhat anarchic vertical ride. Maspes stated "many of these came about as we fled the sultry heat from the valley floor, others were completely improvised during those days in which you just want to forget about everything and explore areas you think you know well but in reality a just beginning to reveal themselves. In moments like this you blindly trust your instinct or perhaps the description of an enthusiastic friend." 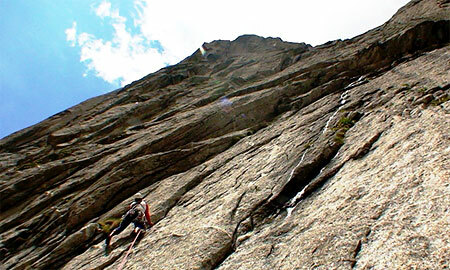 TUTTO VERO, SE Face Picco Luigi Amedeo, 400m, up to VII+ with 3m of A1 on the 3rd pitch, Luca Maspes, Rossano Libera & Anna Ceruti (summer 2006). F.F.A. : Rossano Libera. IL TRIANGOLO D'ORO, Punta Medaccio, Val Merdarola, 210m, 6b and 3 sections of aid. Luca Maspes, Andrea Barbieri, Marco Farina & Mario Scarpa (summer 2006). ZAKIMORT, Punta Vittoria buttress, Val di Zocca, 5 pitches , 6a+/6b, bolts, Luca Maspes, Fabio Salini (summer 2006). Giovanni Ongaro, Giuliano Bordoni, Anna Ceruti, Matteo Foglino, Giuliano Bordoni, Rossano Libera, Giovanna Novella, Andrea Barbieri, Marco Farina, Mario Scarpa, Barnieri, Fabio Salini.